Do you remember how I mentioned I was entering into the writing cave? Let me tell you about my day. It’s been like this for the past week or so with variations on the theme. Sometimes I wake up at 5 am and go to bed at 11 pm. Sometimes I don’t go into lab until after lunch. But you get the gist. I am working. A lot. Don’t get me wrong – putting together science stories makes me happy and provides a gratification like nothing else. But sometimes, just sometimes (usually around 11 pm), it drives this girl to drink. 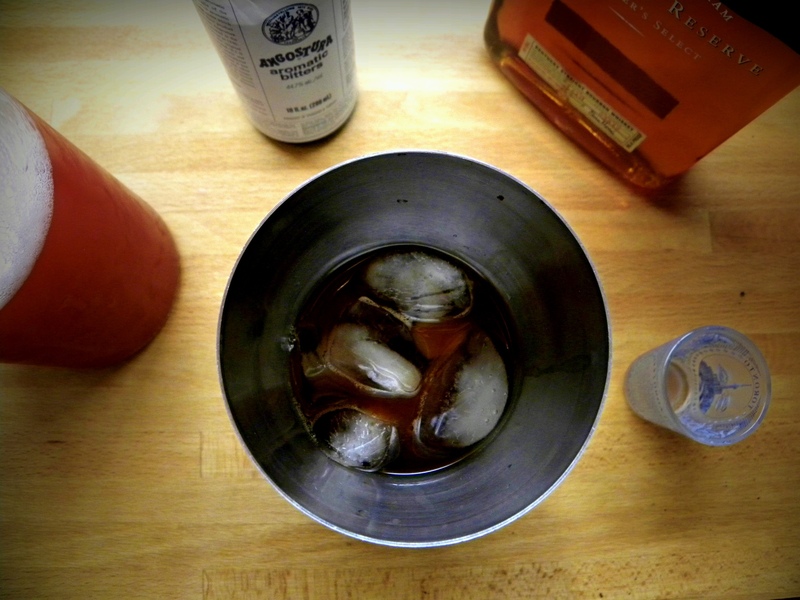 Bourbon + Rhubarb + Rosewater = Brilliant. Bourbon seems serious. So, being in a serious state of mind, bourbon is what I am reaching for these days. 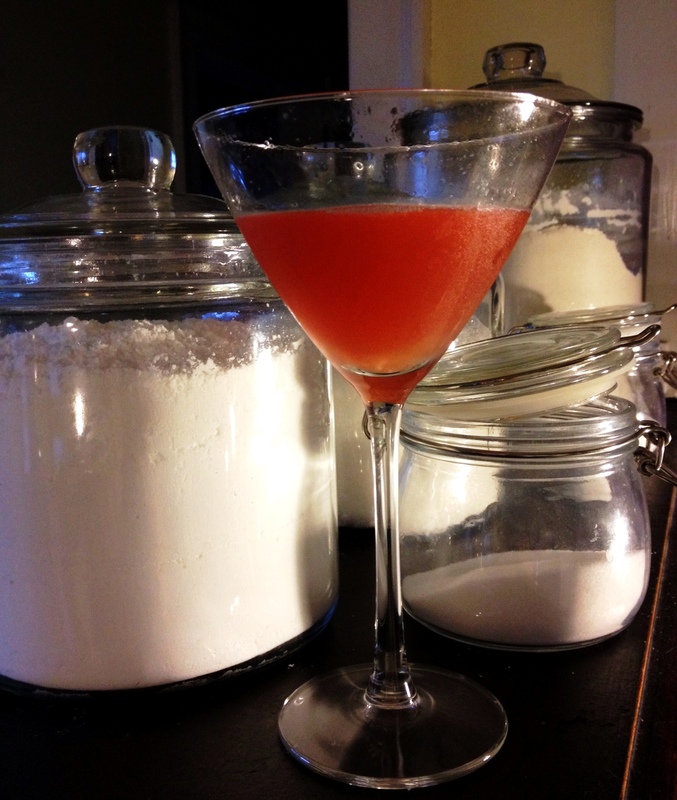 Adding the rhubarb and rosewater was an amazing happenstance. 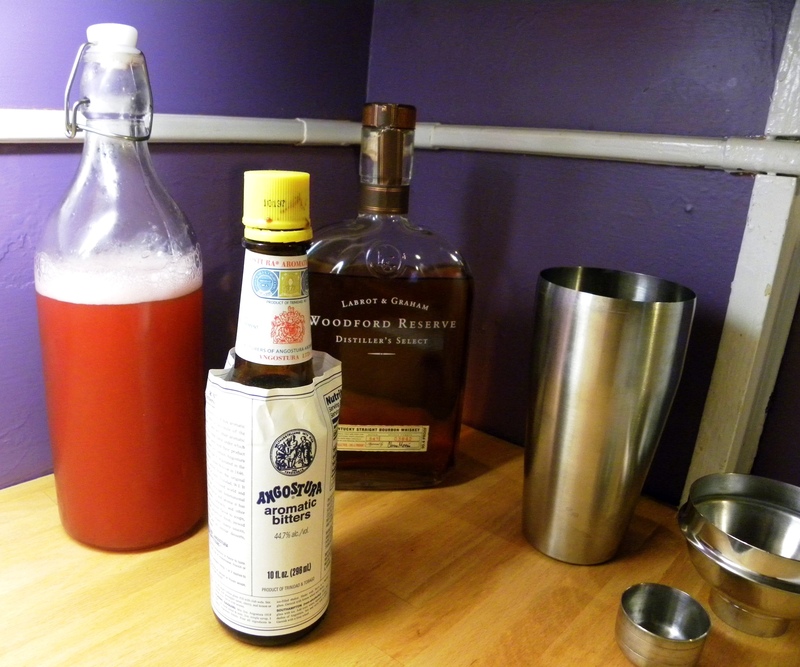 The rhubarb mellows the edge of bourbon without losing any of its bourbon-ness. The rosewater adds a whiff of floral. I like to put in a martini glass and pretend that I’m not glued to my computer. Combine all the ingredients in cocktail shaker. Shake vigorously. Strain into a martini glass. 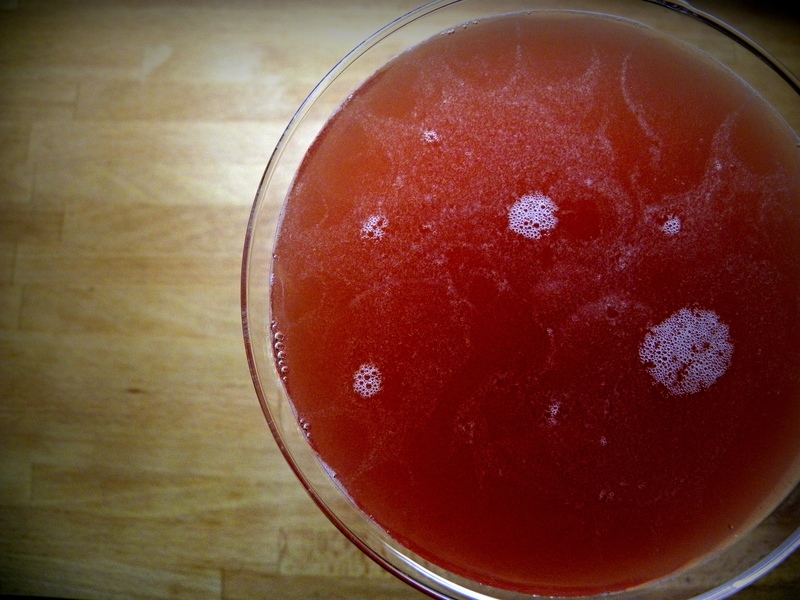 *I made this rhubarb-rosewater syrup and was overwhelmed by the rosewater and underwhelmed by the rhubarb. Which is why I went 50:50 of the recipe below with straight-up rhubarb juice. One could just up the up the amount of rhubarb in the syrup, but I kind of like the astringency that the raw juice brings. Combine the rhubarb and the sugar in a medium pot and let sit (not on heat) for about 45 minutes. Add water, bring to a simmer, and cook for 20 minutes, stirring occasionally. Strain and return juice to pot and heat. Add lime juice and cook until reduced to 1/2 volume. Cool. Stir in rosewater. Store in a air-tight jar in the refrigerator. So it turns out that my stove has a gas leak. Bad news. As I wait for the repairman to come and look at it (and it looks like he won’t make it out until Monday), I have had to find a way to eat without cooking. It’s been a lot of salad. Luckily, I’ve been infatuated with this simple and pretty salad. 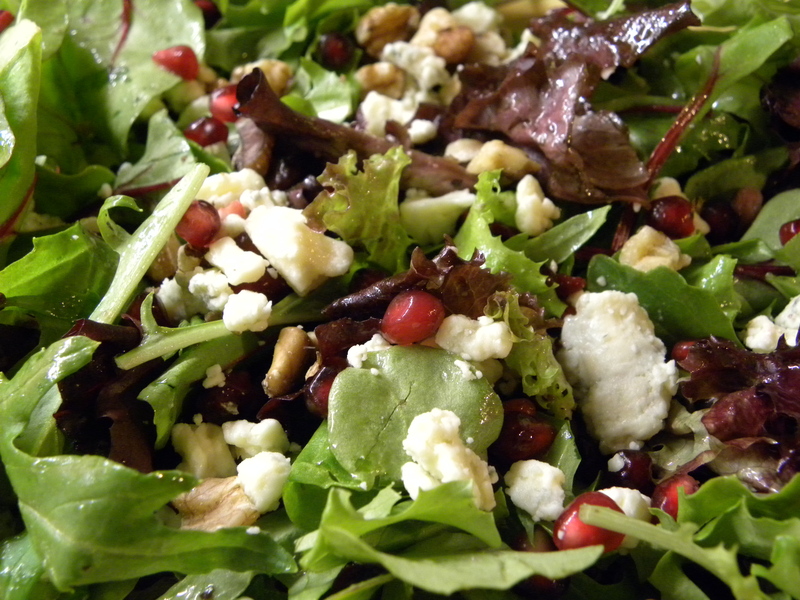 Salad greens, blue cheese, toasted walnuts and pomegranate arils all dressed with a red wine vinaigrette. That’s all there is to it. I love the pop of color from the pomegranate and the punch of sweet-tart flavor they provide. It’s been a lifesaver while my stove has been out of commission. My second seasonal obsession has been cranberries. I had bought a bag of fresh cranberries for some apple-cranberry tarts I made for Thanksgiving and have been trying to figure out what to do with the rest of them. I’ve been working on a cranberry cocktail, one inspired by the mojito and I think it’s pretty damn good. 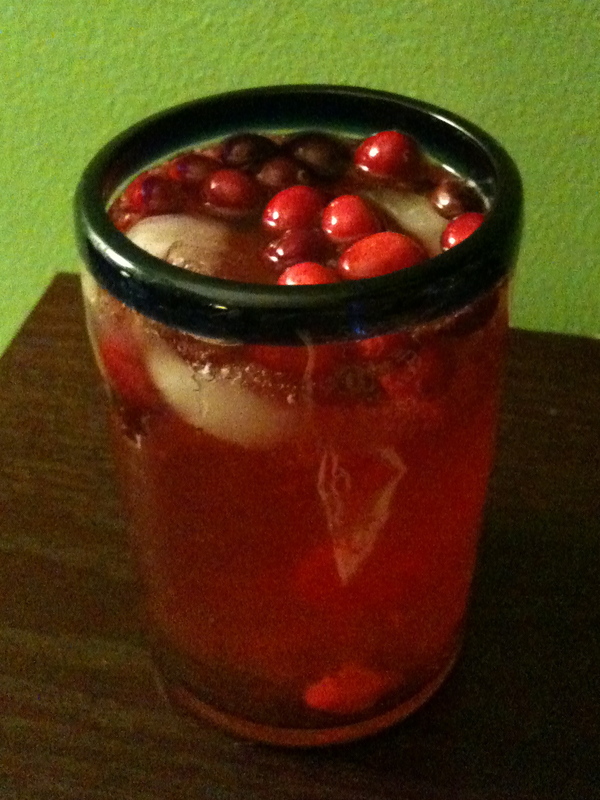 Muddle some cranberries in the bottom of a glass. Add some mint simple syrup (equal parts sugar and water, cooked until dissolved) and white rum (my favorite is Appleton). Top with some lime seltzer water. Enjoy! It’s also certainly helped me deal with my current kitchen disabilities. Plus, the pomegranates and cranberries have not only been feeding me, but also my color addiction.